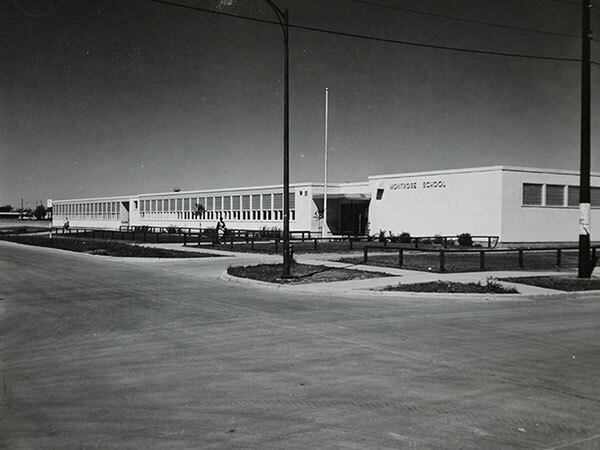 Conceived as a temporary measure by the Winnipeg School Division to accommodate a pulse of students arising from the post-war baby boom in Winnipeg, the original Montrose School building was constructed between 1953 and 1954 at a cost of about $200,000. Its 14-classroom configuration was expanded in 1957 with five additional classrooms, a therapy room, and two washrooms. By 1999, it was determined that the school no longer met the needs of the area so a new building was constructed beside the original one, which was then demolished. The new Montrose School featured eight classrooms, computer room, library, life skills area, counseling space, gymnasium, and daycare facility. It opened in May 2000. We thank the Winnipeg School Division and Nathan Kramer for providing information used here.